I recently found a couple of security issues with the Telegraph.co.uk website. The site contained an Open redirect as well as an XSS vulnerability. These issues were in the authentication section of the website, https://auth.telegraph.co.uk/ . The flaws could provide an easy means to phish customer details and passwords from unsuspecting users. The fix went live between the 11th and 14th of July, 2 months after the issue was reported. The code served via auth.telegraph.co.uk appeared to have 2 vulnerabilities, an open redirect and a reflected Cross Site Scripting (XSS) vulnerability. Both types of vulnerabilty are in the OWASP Top 10 and can be used to manipulate and phish users of a website. As well has potentially hijack a user's session. Compromised URLs, that exploit these flaws would have typically have been circulated to potential victims, in emails, via twitter or facebook. The fact the web-pages were served via HTTPS, provided no added protection for the user. HTTPS was encrypting an already compromised page. The Open Redirect was on the reenterPassword.htm page, and allowed any URL to be entered via a URL argument and used to override the desired value. A screen capture of the affected page. More details on this sort of vulnerability and how it can be mitigated can be found on the OWASP site. 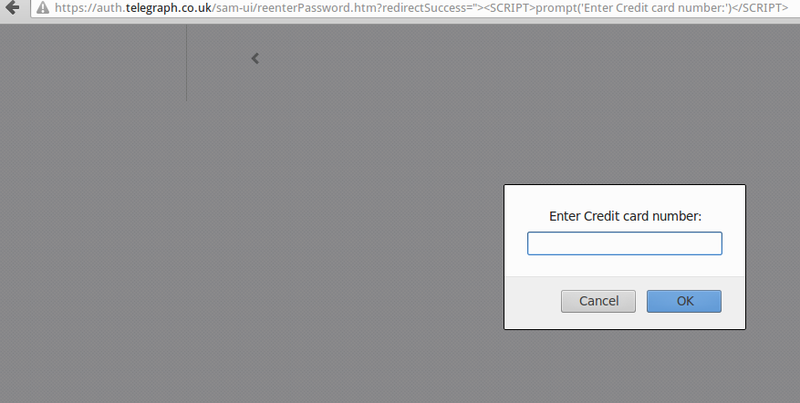 The Reflected XSS issue was discovered on the login.htm page, and allowed a URL and arbitrary javascrpt code to be included in the plink URL argument. As you can see, clicking on the Form would have resulted in the alert message 'HACKED' being presented to the customer. In a real exploit, the attackers might choose to insert more subtle code or requests for information into the page to steal or phish a users details or session. Details on a similar flaw in the Guardian's web site, found last yeah can be found here.